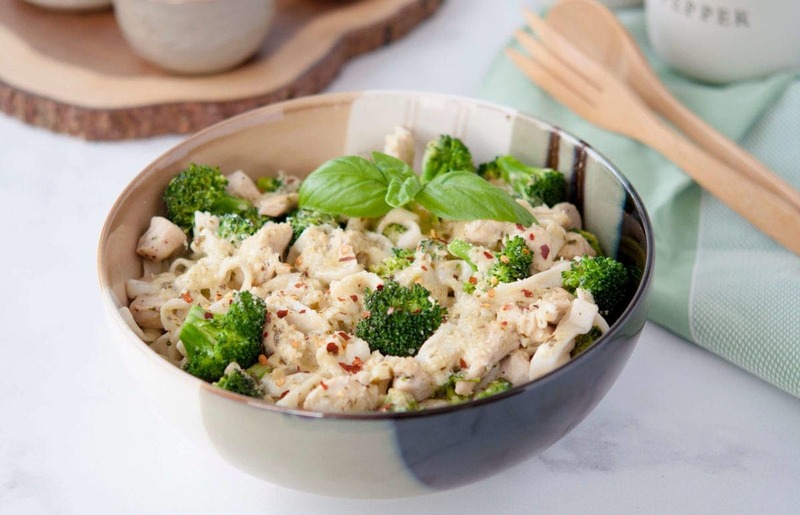 Chicken and Broccoli Keto Fettuccine Alfredo with Pesto is comfort food at its finest. 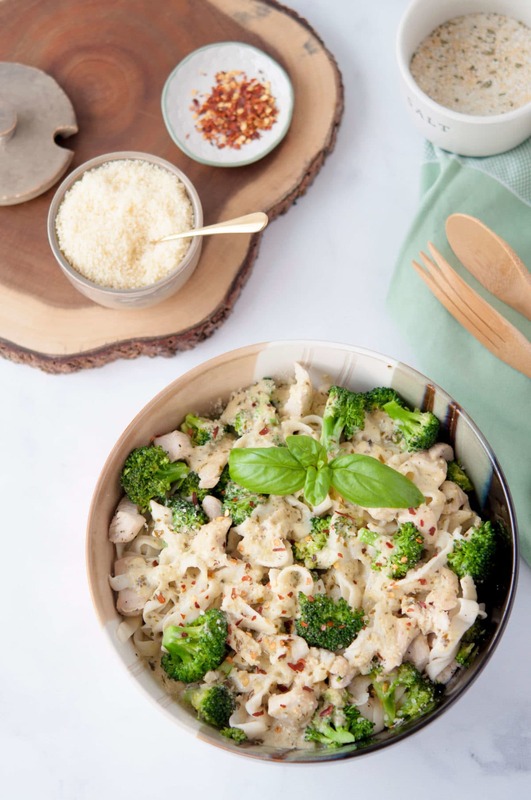 If you’ve been missing pasta on your low carb diet, look no further. 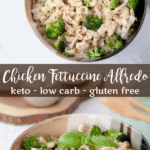 Gluten free and keto fettuccine alfredo! Could it really be? YES! Your eyes are not deceiving you. 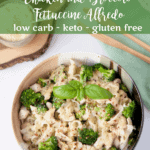 You can in fact have chicken fettuccine alfredo and still keep it keto. But how? 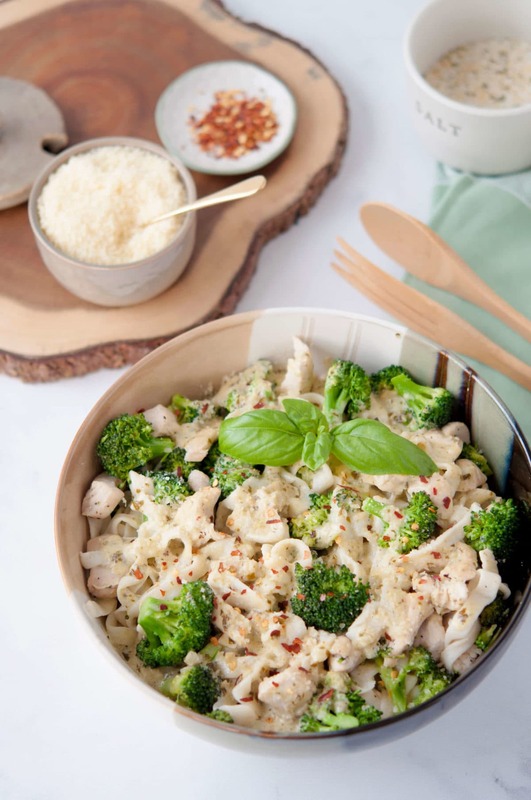 Well for starters this recipe calls for a scratch made low carb alfredo sauce recipe. When made more traditionally, alfredo sauce is already keto by nature as it is usually just butter, garlic, cream, parmesan, and pepper. Easy peasy. 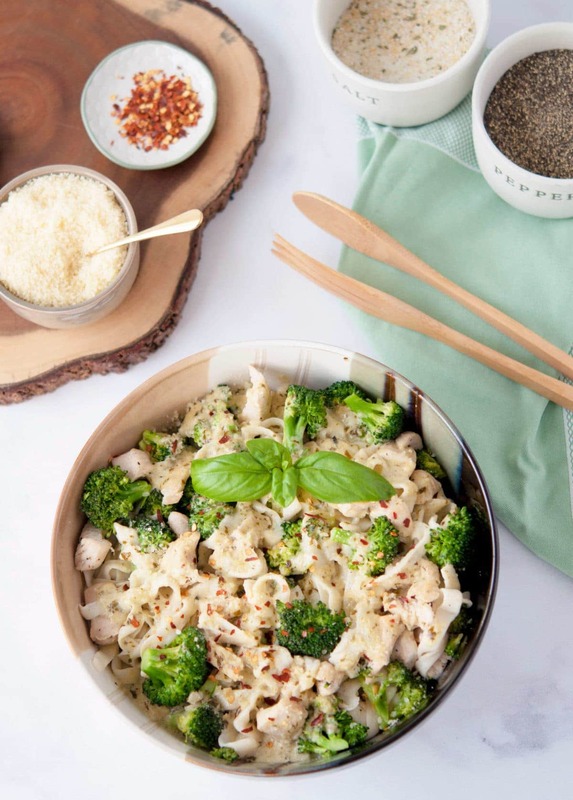 For this keto pasta recipe we are kicking things up a notch and adding in an extra punch of flavor in the form of pesto. I wasn’t always a fan of pesto sauce. It always tasted too earthy to me. Well I have come around in a big way. Especially when we are talking about mixing it into a cream sauce. If pesto isn’t your thing, you can always leave it out and this dish will still be amazing. 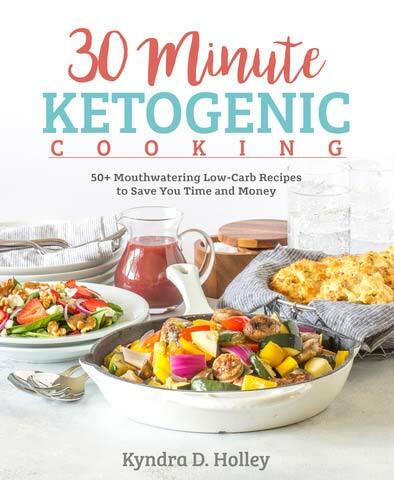 A good keto pasta recipe is something that has eluded us forever and is one of the things we all miss the most. 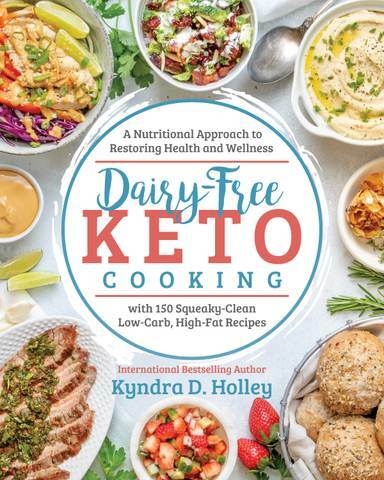 Prior to living a ketogenic lifestyle, my food groups were bread, pasta, potatoes, rice, and fried foods. 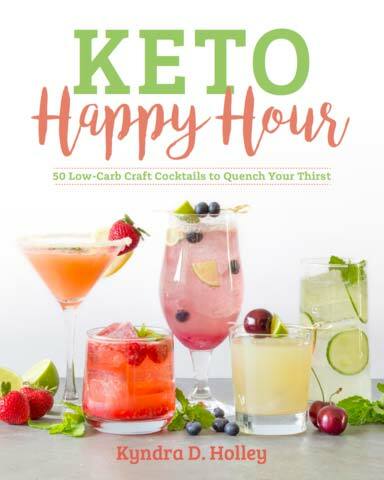 Those just happen to be all of the hardest things to recreate into low carb versions. Well, with a little creativity and realistic expectations, you can can still enjoy healthier versions of all your old favorite foods. 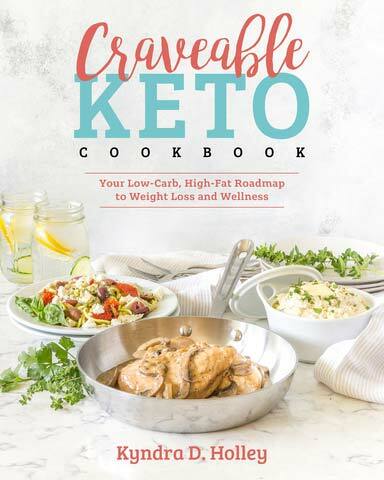 Some of my favorite low carb pasta substitutions are shirataki noodles, zucchini noodles, spaghetti squash, cauliflower, butternut squash noodles, and Rainbow Vegetable Noodles. But the one I want to talk about today is shirataki noodles. Shirataki noodles, konjac noodles, miracle noodles, Japanese yam noodles – Whatever you wish to call them, there is one thing that usually rings true. They stink! They do. They really do. If you’ve ever opened up a bag of these low carb noodles, then you know the smell I am talking about. For many, it has been so off-putting that they opt to not even give them a try. But I am going to give you some tips and tricks that just might change all of that. So how do you make shirataki noodles taste good? #1 It is largely dependent on the type of noodle you buy. I could never get used to the texture or taste of them until I found just the perfect brand. Now, it is the only brand I buy. It truly makes all of the difference in the world. I have been able to find them in nearly all of the grocery stores near me, but I usually buy them in a box of 10 from amazon because it saves money. This is the brand of shiritaki noodles that I recommend. I have tried many other brands and have not been a fan. #2 Preparation is the key. If you try to take a bag of shirataki noodles and toss them directly in a pan, this is your first mistake. It is important to drain the liquid they are stored in and soak them in a bowl of fresh water. From there, drain them and give them another good rinse. If they still have an odor or feel a little slimy, I like to dry fry them in a pan for a few moments. Taking all of these steps will really help them absorb the flavors you are cooking them in and lose a lot of that rubbery texture. While this really helps, they are still not for everyone. I have found that using them in asian inspired cooking is usually the gateway into loving them. In my book Dairy Free Keto Cooking, I made a beef ramen that is so spot on taste and texture wise that I simply cannot get enough of it. They definitely resemble the texture of rice noodles more than they do a traditional flour pasta. However, through finding the perfect brand and taking the time to properly prepare them, I have become a big fan! use zucchini noodles for low carb pasta in place of the shirataki noodles. Season the cut-up chicken generously with salt and pepper. Heat 1 tablespoon of the olive oil in a large skillet over medium heat. Once the oil is hot, add the chicken to the pan and sauté until it almost completely cooked through. 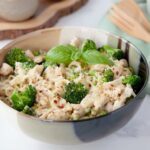 Add the broccoli and the remaining 1 tablespoon of the olive oil to the pan and cook until the chicken is cooked all the way through, and the broccoli is crisp-tender. While the chicken and broccoli are cooking, heat the butter and garlic in a medium sauce pan over medium-low heat. Cook until the garlic is fragrant and the butter begins to brown. Increase the heat to medium and add the heavy cream, parmesan cheese and pesto. Bring to a slight boil and then reduce the heat to medium-low and let simmer and thicken. Once the sauce has thickened, toss the shirataki noodles in the sauce and cook until the noodles are warmed. 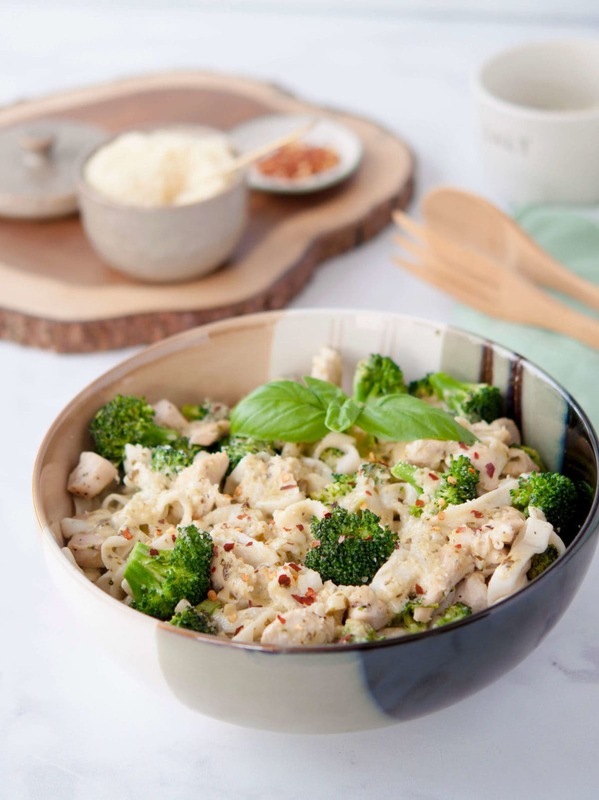 Add the sauced noodles to the pan with the chicken and broccoli and toss to combine. Garnish with fresh basil and red pepper flakes, if using. 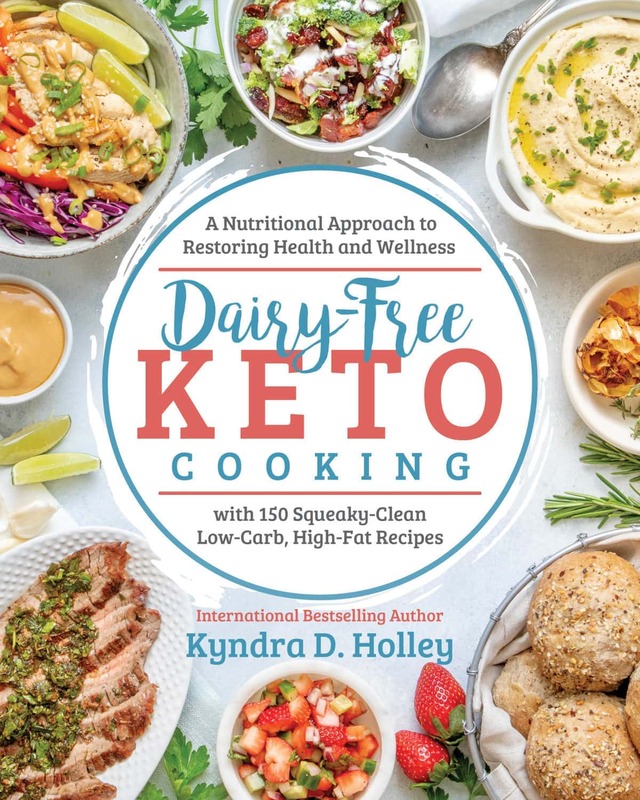 Kyndra – have you tried Kelp noodles?? I just found them in my local store — even lower carb than shirataki! I bought them but haven’t tried them yet. I personally have not tried them or cooked with them. Have you tried dry roasting them in a pan after you rinse them? Or pre-boil them? I heard dry roasting really helps eliminate the odor.